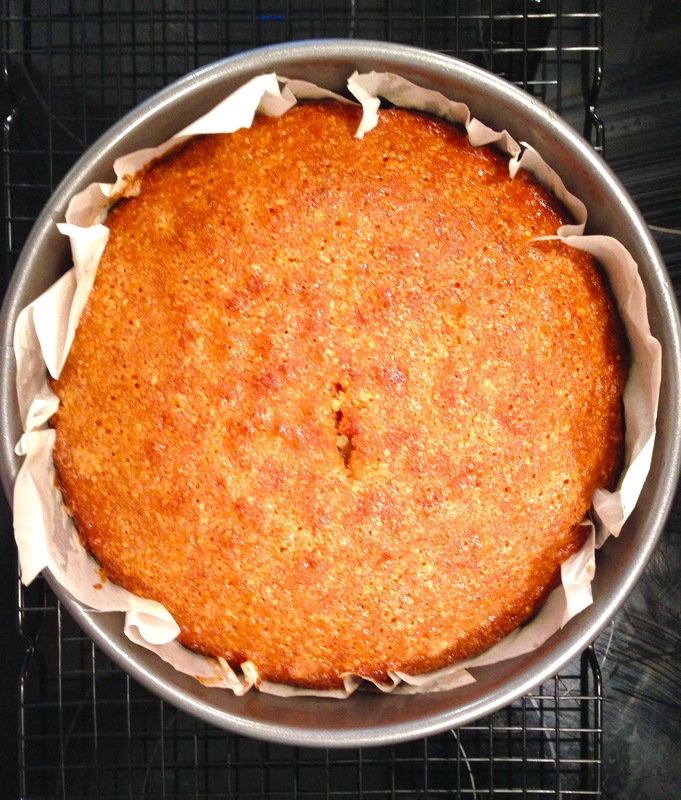 Almond and Orange Syrup Cake – One Half Indian. This weekend my husband and I went to dinner at my sister-in-law’s house along with some other relatives in the area. She made delicious paneer parathas, black eyed peas, and potato sabzi. 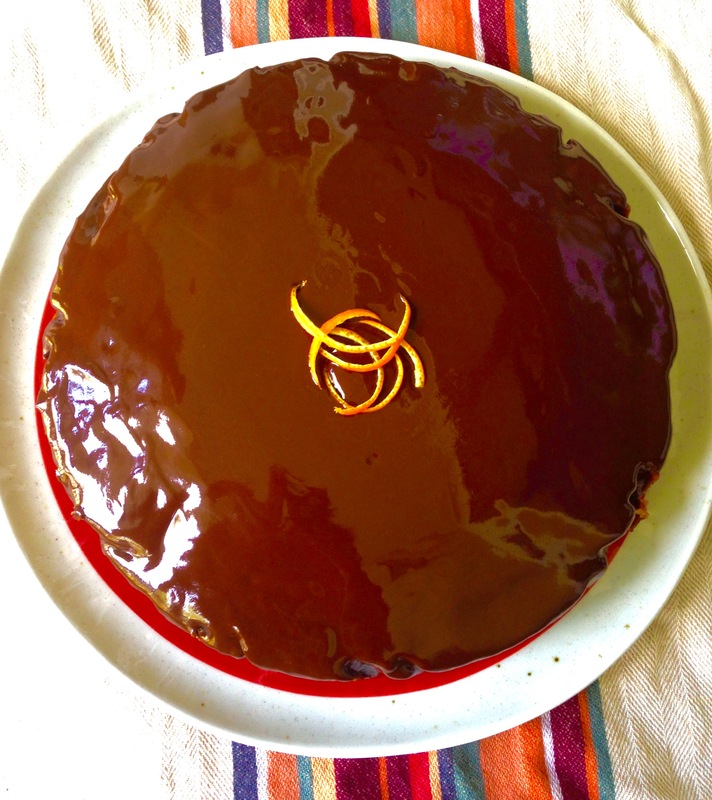 I brought dessert for everyone, and I decided to try a new recipe from Ottolenghi’s cookbook Jerusalem. This cake is delicious, but it is filling and somewhat heavy from all the almond meal and eggs. I think some ice cream or whip cream along with it would help lighten it up some. This cake could also make a lovely morning coffee cake or tea time cake. Preheat oven to 350 F and grease a 9 1/2 inch springform pan with butter and line the sides and bottom with parchment paper. Place the butter, 1 1/2 cups of sugar, and both zests in a stand mixer fitted with the beater attachment and beat on low speed to combine everything well. Do not work the mixture too much or incorporate too much air. Add half the ground almonds and continue mixing until combined. With the machine running, gradually add the eggs, stopping to scrape the bottom and sides of the bowl a couple of times as you go. Add the remaining ground almonds, the flour, and the salt and beat until completely smooth. Pour the cake batter into the pan and level it off with spatula. Bake the cake for 50-60 minutes. Check to see if it is ready by inserting a skewer into the center. It should come out slightly moist. When the cake is almost done, put the remaining 1/2 cup of sugar and the citrus juices in a small saucepan and bring to a boil. When the syrup boils, remove it from the heat. As soon as the cake comes out of the oven, brush it with the boiling syrup, making sure all the syrup soaks in. Leave the cake to cool down completely in the pan before you remove it. You can then serve it as is garnished with orange zest strips or ice it. For the icing, I just melt my chocolate in the microwave rather than in a bowl over boiling water. But feel free to do the boiling water thing. For the microwave, break your chocolate into small pieces, add the butter and honey to the bowl. Microwave at 50% power for 35 seconds at a time. After each 35 second increment, remove the bowl and stir several times with a spoon. It will seem like nothing is happening the first few times, but stir anyways. This helps the chocolate to melt at a lower heat which helps it retain its shine. Heavy or not – the cake sounds wonderful! Orange, almonds and chocolate is a combination I´d run miles for. This looks delicious! I’m hungry just looking at the pictures!